As Thanksgiving approaches, we at Appalachian Voices want to pause a moment to give thanks for the most important component of our campaigns — our members such as you. Through your generous support we are working to help the many people in Appalachia whose lives are directly threatened by polluted air and water and devastation to the land. Please take a moment to watch this video from citizens who have benefited from the staunch support of our members. Months of grassroots and direct outreach from Appalachian Voices and coalition partners came together this week when Isle of Wight County in southeast Virginia adopted an official resolution opposing the proposed Surry coal-fired power plant. Downwind of the proposed plant, the largely agricultural Isle of Wight is the second locality to openly oppose the plant, and joins a large number of health and conservative organizations that have also voiced their opposition. Despite rain and a threat of thunderstorms, nearly 150 people came out to support citizens from southwest Virginia at the Rally to Keep Ison Rock Ridge Standing at EPA headquarters in Washington, D.C. last week. Chanting, singing, and impassioned speeches took place at the rally — organized by Appalachian Voices, Southern Appalachian Mountain Stewards, and coalition partners — and more than 25,000 people across the country simultaneously sent messages to the EPA and President Obama, asking for the permit to be denied. New mining jobs figures might have congressional representatives with coal industry ties scratching their heads. 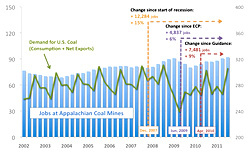 The argument that regulation of mountaintop removal mines threatens coal mining jobs in Appalachia is weakened further by data from the Mine Safety and Health Administration that shows that jobs at Appalachian coal mines rose in the first three quarters of 2011 to reach a 15-year high. Going by the numbers, Congress can create coal mining jobs in Appalachia by ending mountaintop removal today. Carry your support of the mountains with you every day. 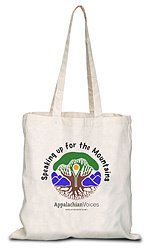 Join, renew, or give at the $35 level or above before December 31st and receive our recycled cotton tote! Last Chance for a Goode Deed! 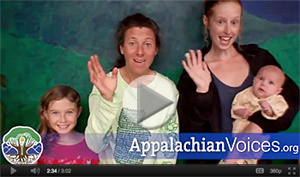 Appalachian Voices is featured on GoodeDeeds.com, a site that promotes art for charity. Buy a print, or get ready for the holidays with gift bags. 100 percent of proceeds benefit Appalachian Voices. The DVD release of The Last Mountain is here, and Appalachian Voices members receive 10 percent off any purchase made (and we receive ten percent of each sale). Simply follow this link and use the code TLMT11. Nov. 22: This folk duet combines vocal harmonies with passionate views on mountaintop removal and support for AV. Dec. 3: Embark on an 8-mile hike. The Tennessee Wilderness Act of 2011 will expand the Little Frog Mountain Wilderness. Dec. 3: Greet the holiday season in sustainable style with four bands, a raffle and sunshine-fueled LED lights. Dec. 13: See this mountaintop removal doc with friends, food, brews and the AV crew at Blue Mountain Brewery.